Anther oldie but a goodie. J.E.B. Hall used to write for us…and it was good. Then the angry hamster started traveling the world in support of sports. Here’s one of J.E.B’s first SCOF essays from issue no. 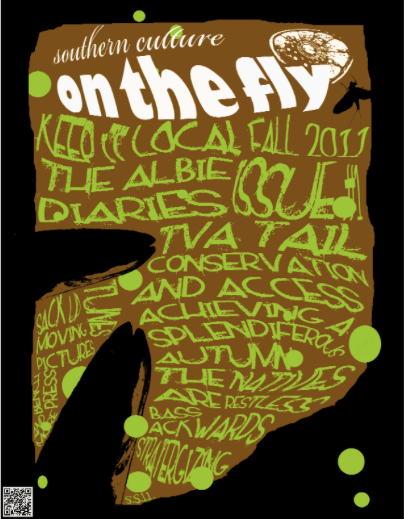 1 – FALL 2011. In this little ditty, J.E.B takes on the task of informing us all how to achieve bliss during the delayed harvest season. Where art thou J.E.B…we miss you. Delayed Harvest season has come to the Southeast once again. 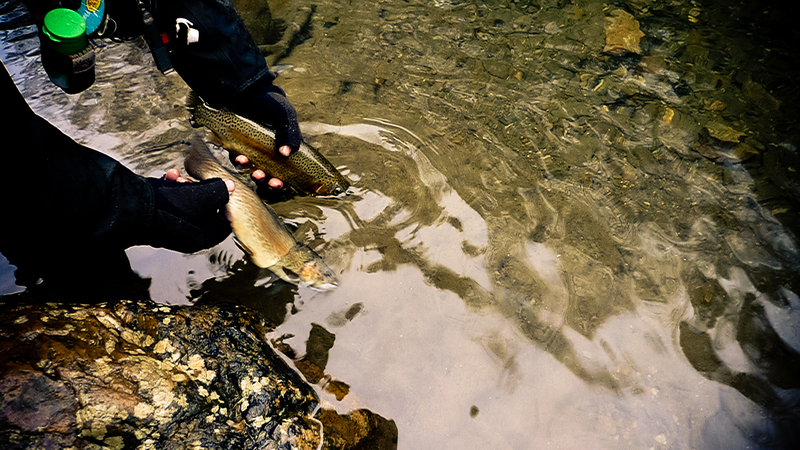 This is a magical time of year when the rivers are low, the water is clear, and state wildlife agencies pour writhing buckets of “mountain trout” into pools thought deep enough to sustain life. 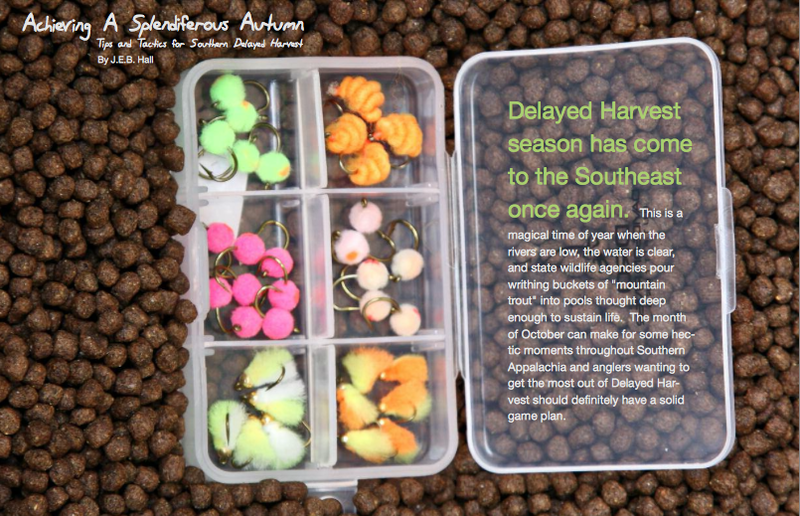 The month of October can make for some hectic moments throughout Southern Appalachia and anglers wanting to get the most out of Delayed Harvest should definitely have a solid game plan. Choosing the right spot is key to mastering Delayed Harvest. There are several indicators that mark a particular stretch of river as good holding water for mountain trout and the best way to access this water is by parking in the right gravel pull- out. The most obvious pullouts are near bridges. Bridges seem to have a magnetic attraction for trout and fishing the pools directly under them will almost always end in success. Another key feature to look for is easy access. Choosing water within a 20-yard walk from the car will ensure that anglers get the maxi- mum amount of fishing time and allow those driving along the road to see them in action. Finally, the most assured sign of good fishing are other vehicles parked in a pullout. Parking near prime water can be complicated, but anglers shouldn’t let a full parking area discourage them. Delayed Harvest parking should be approached like a game of Tetris and with some flipping, flopping and 12-point turns, everyone can enjoy access to the best pools. It has been said that in fly fishing, presentation is everything. This couldn’t be more true when it comes to fishing Delayed Harvest. One of the most common techniques is referred to as the “mid-stream down stream.” The concept here is to wade into the the exact middle of the river, face directly downstream, and rhythmically strip Wooly Buggers through the run until they come to rest at the tip of the fly rod. At one time, this style of fishing was so popular that Wooly Buggers became scarce in the fly bins of local shops and any shop guy with a bobbin and vise could double their salary by tying custom “boogers”. As effective as the “M.S.D.S.” technique is, today’s Delayed Harvest anglers need to have a few more arrows in their quiver when faced with adverse conditions. One of those arrows should be the ability to water haul. Water hauling is important for some of the extreme distances anglers face while casting to mountain trout. To throw the long bomb, the line should be allowed to make contact with the water on each casting stroke and then violently ripped back into the air again. When properly executed the fly will make a distinct “bloop” with each stroke. There is no better way to get a fly out into those magical 30’s than water hauling. For more the more advanced angler, studying some of the cutting edge tactics that local experts have developed to entice fish will certainly enhance their game. The most radical of these is the “dance of death”. This downstream presentation involves adding yards of slack to the line and waving the rod side to side to make the fly dance enticingly as it drops down to the fish. Hook sets in this situation can seem impossible, but leaving hooks armed with a barb helps to seal the deal. The “dance” should only be attempted by experts as it requires a Jedi-like sense of awareness to be effective. instead, choose to wear chest packs and gear bags. Like potato chips, one gear bag is never enough. A combination of a backpack, a chest pack and a waist pack is sure to get heads turning and fellow anglers wondering if they should ask for an autograph. All of these bags should be color coordinated and stuffed full for more stunning visual effect. You must display a TU sticker. Preferably one that spells out the words “Trout Unlimited”. Membership is optional. Stickers from manufacturers may only be displayed if there are more than three separate companies represented. 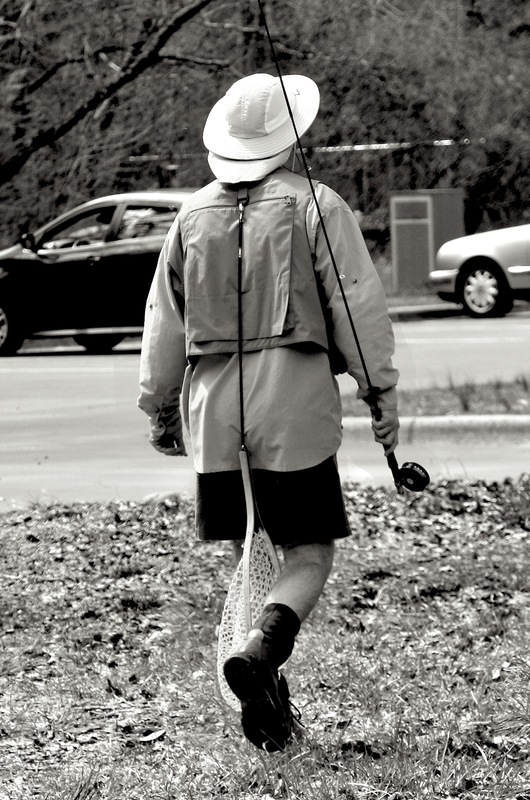 Anglers are not required to own any of these brands of gear. There must be sufficient sticker coverage as to render the vehicle’s rear view mirror useless. Some stickers must be placed on areas forward of the taillights. Vehicle must always be parked to allow maximum sticker visibility. Fly fishing is, and always has been, considered a “gentleman’s sport.” Proper etiquette is the dignified bond that ties all fly anglers together. Delayed Harvest streams often come with their own set of behavioral guidelines based on location and the local fishing population. There are some common themes among all DH anglers that should be referred to when on the water. The first thing to remember is there is no such thing as too crowded. The more people in a stretch, the better the water is being covered. More than five anglers fishing in a run establishes what is known as a “Wall of Pain.” Establishing a “Wall” creates a great opportunity for anglers to watch other anglers catch fish, and at the same time, deftly blocks boat traffic from making its way downstream. Anglers should also keep in mind that “fishing through” is their God given right, and they should never let some bogged down duffer stop them from reaching their desired water. Most important rule in DH etiquette addresses the issue of guides. Fishing guides should always be regarded as second class citizens. Anyone who refers to going fish- ing all day as “work” is clearly a noncontributing citizen and has not earned the same rights to use the water as someone who is fishing to feed their soul. Actions such as blocking guides’ access to boat ramps or casting into their sports’ runs is not only acceptable, but should be encouraged. The fewer the guides, the better the fishing. Delayed Harvest fishing is tough, but the dedicated Southern fly angler is tougher. Following the advice given above is a good baseline to having a successful season on the water. Those looking to take their fishing even further should follow this article up with fly angling research basics such as fly shop employee interrogation, Internet chat board discussions and intensive magazine studies.